Its truly an amazing thing to go from, “your child will never see, or hear, or walk, or talk” to reading independently, enjoying mathematics and writing letters. Believe it or not, that is what Jacob has done!! Jacob is only 4 years old, and while he cannot yet communicate entirely using his language, he can communicate using a letter board. With this simple device, we can ask Jacob anything we want and he has endless options for answers, simply by pointing to the letters. 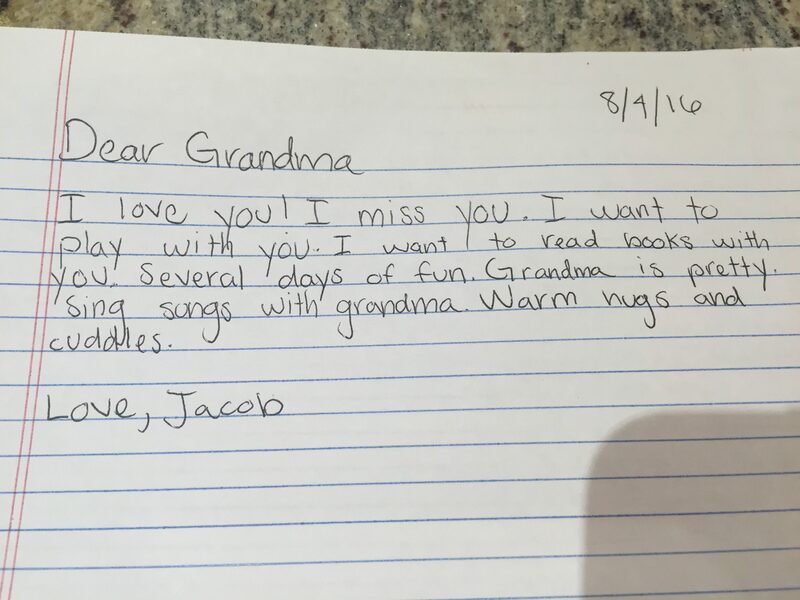 A few weeks ago, Jacob read a book, A Letter to Grandma. He was very excited so we asked if he would like to write a letter to his grandma! He pointed to the letters Y-E-S and got started! Here is what Jacob wrote! We are so impressed, everyday, by our amazing miracle. We are forever grateful to the specialists at The Institutes for the Achievement of Human Potential for opening our eyes to the endless abilities of our incredible boy! Jacob is doing incredibly well intellectually. Next on our list, mobility! Jacob works very hard everyday to get crawling and he continues to improve. We look forward to the day we celebrate his crawling victory! Previous PostJacob’s new role!Next PostCome play with Jacob! This makes my heart so happy. Go Jacob!